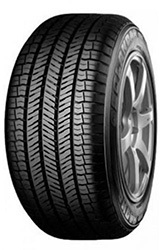 The Yokohama G091A is part of the very successful and highly regarded Geolandar range of off road tyres. The tyre features four symmetrical grooves designed to aid grip in the wet, aiming disperse water and mud as quickly as possible. This is a perfect example of a strong off road tyre that doesn't lose perfomance when used on road, and maintains control and stability in all conditions.